Intervitis – Interfructa international technology trade fair 2013 is the most important appointment for expositors, visitors and insiders of the wine, fruit, fruit juices and spirits industry. It opened the doors last 24th of April and concluded three days after, on the 27th. CDR WineLab®, during these days, had his own stand among the 60.000 square meters of the Messe Stuttgart exhibition space. Many people from all over the world, in particular from North and South America, visited our stand asking for information about CDR WineLab®. The characteristics of our instruments have encountered their analytical needs and Intervitis – Interfructa has represented the right occasion for showcasing specifications and standards of the instrument, analysis and methods, advantages and news. 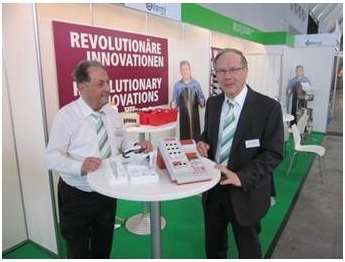 Our German distributor, Kübler-Alfermi GmbH, managed the logistics and the commercial relations at the fair. His report confirmed Intervitis – Interfructa to be an important attractive pole for insiders of wine industry, presenting a wide technological offer for the entire process chain, from cultivation to marketing, with an important focus on wine. that best suits winemaker needs!! Wine analysis: CDR WineLab® at Intervitis-Interfructa 2013 was last modified: May 22nd, 2017 by CDR s.r.l.